IN STOCK High end Elite Choji Polish no-hi blade. Select and Customize your own style - One Low Price, No Hidden Costs - Ships within 1 week!! - Assembled and Shipped within 1 week from Los Angeles! 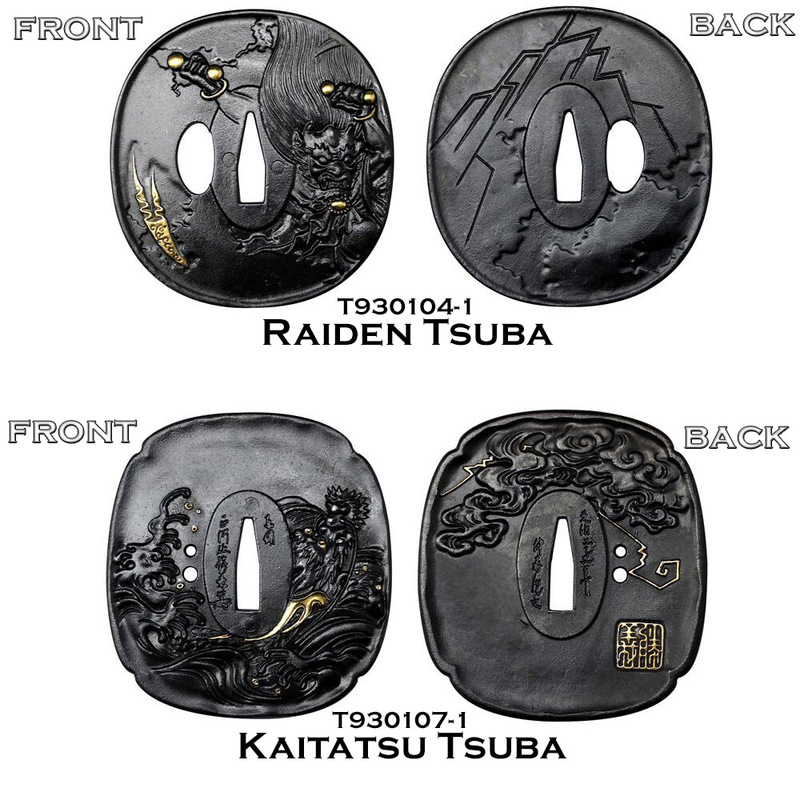 This is one of the most exciting developments in the sword industry for YEARS - the option to customize your own high quality, solid performing out of the box T10 tool steel differentially hardened Katana with real hamon WITHOUT waiting for weeks, months or even years - at an incredibly low price and assembled and shipped from WITHIN the United States.. 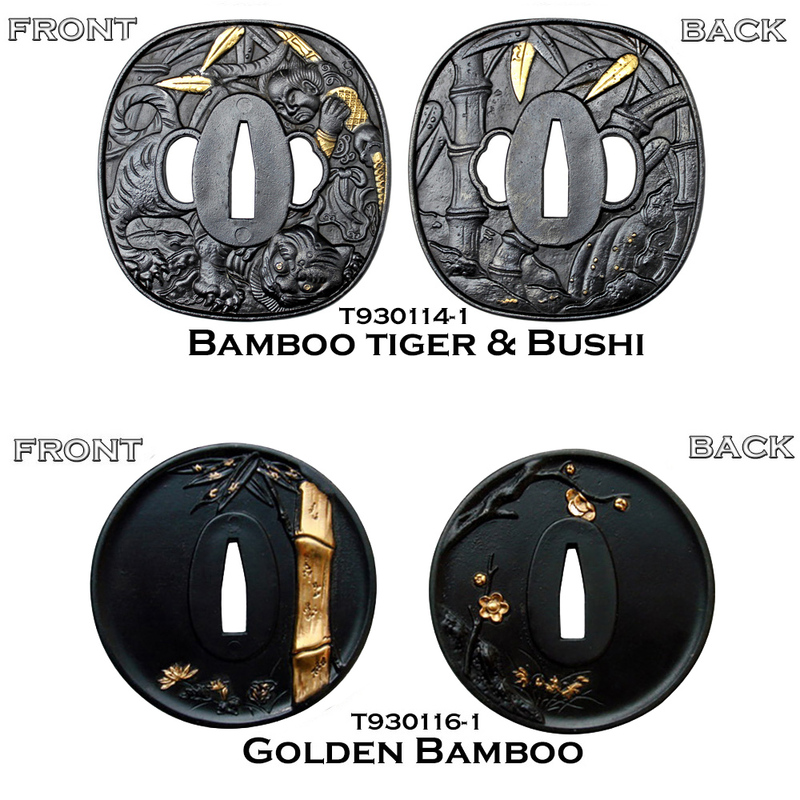 The concept was developed by Mr. Sam Sung, one of the co-founders of Musashi Swords and with the modular assembly system he has developed, keeping a large variety of parts in stock and YOU select what design best suits your unique style WITHOUT breaking the bank..! 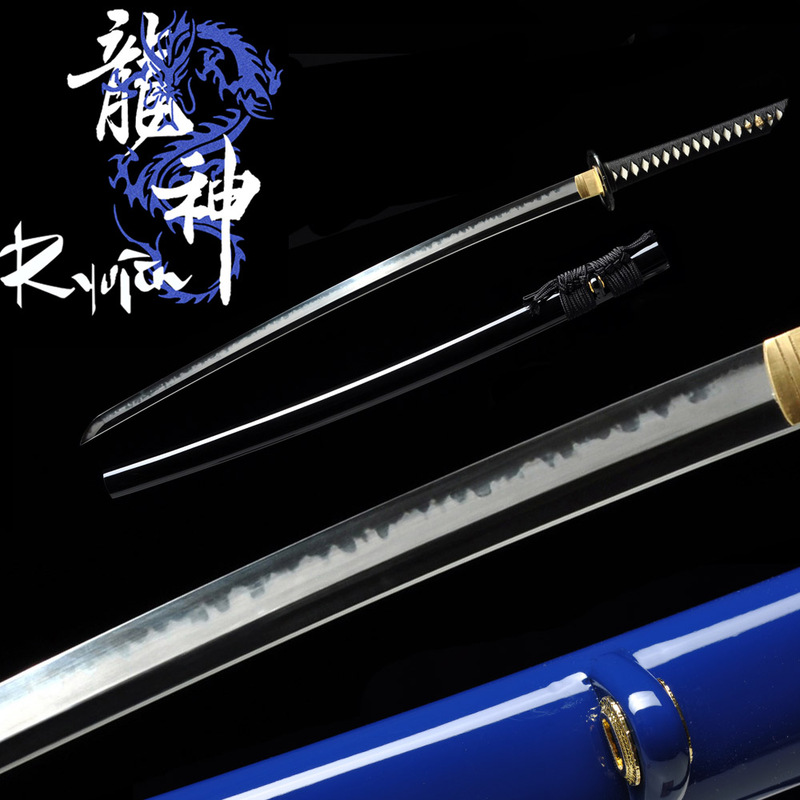 This ELITE version has the same customization options as the standard SBG Ryujin custom katana but features a much more visually appealing blade with active choji midare hamon line and traditional reverse hadori finger polish to bring out the rich detail and as such as the more traditional of the two. Like the standard version it was developed working closely with Mr. Sung and his team, utilizes only the BEST available options to ensure you get the best looking, best performing cutting Katana possible - fully guaranteed to not only meet but EXCEED your expectations. With only the best options available, it is practically impossible to design a bad looking sword. Just pick the components that you like the look of best and let us make it real for you! But don't make the mistake of thinking these swords are just pretty ornaments - these are serious, practical blades that are surprisingly robust yet traditionally constructed and at our special introductory price, are some of the best cutting swords available anywhere near this price point. The ability to customize them is indeed just a very special free bonus!! 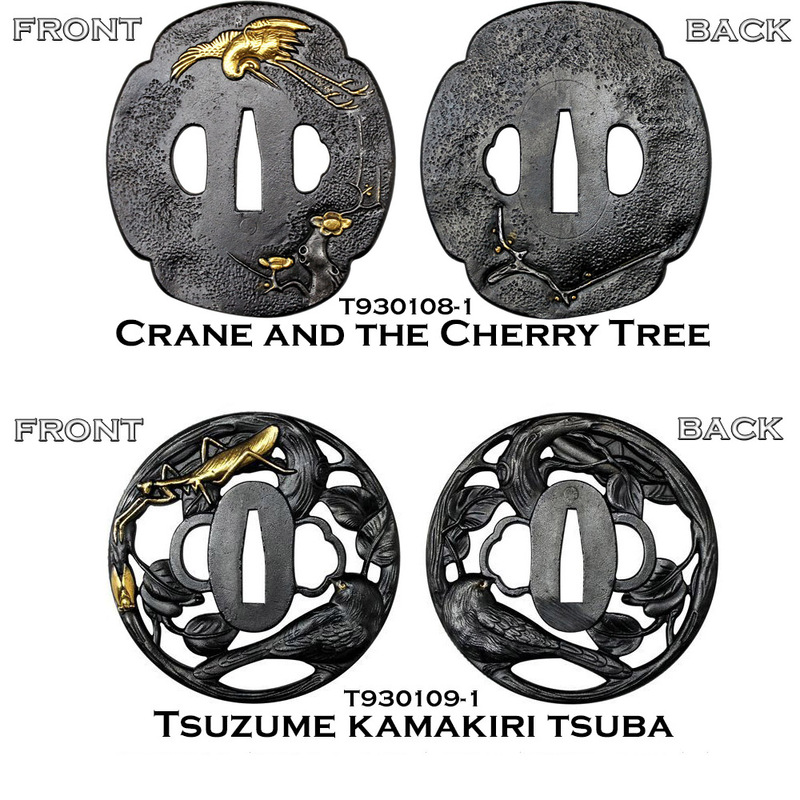 1) Select which Tsuba you wish to be mounted. 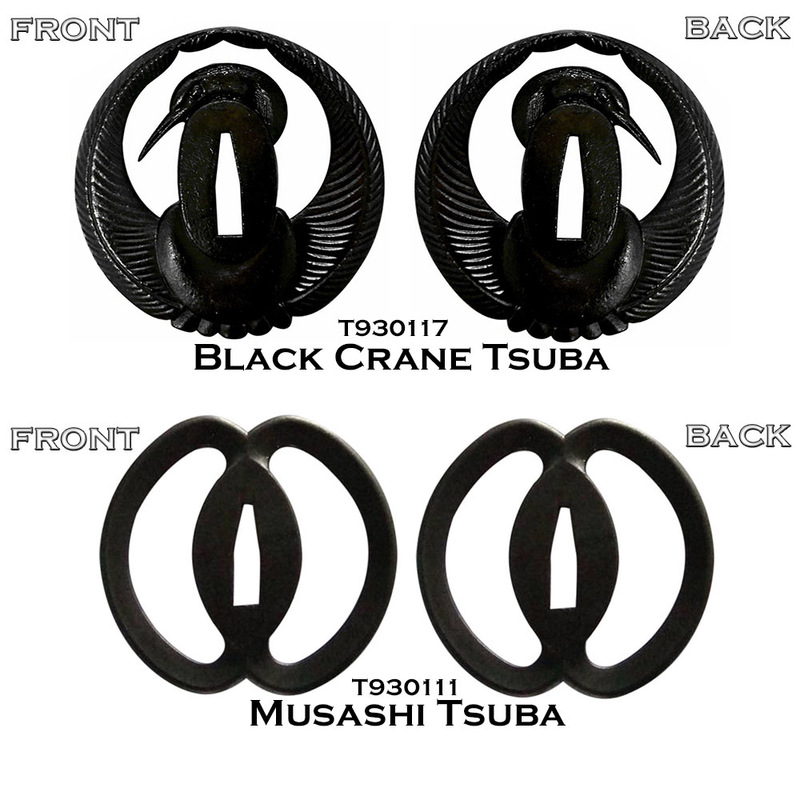 All tsuba are made from solid iron and all but the Double "C" Ring Musashi and Black Crane tsuba feature REAL gold accents to give the design a splash of color at NO additional cost to you (normally $75 more!). 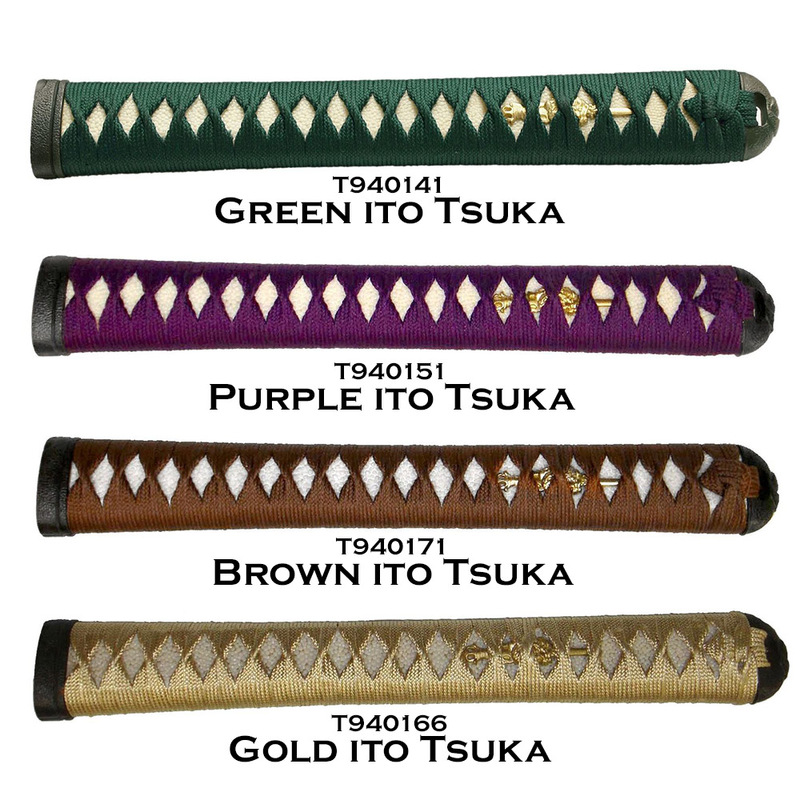 The 'Front' is the Omote and is the side that faces the tsuka, the 'Back' is the Ura and faces the tip of the blade. 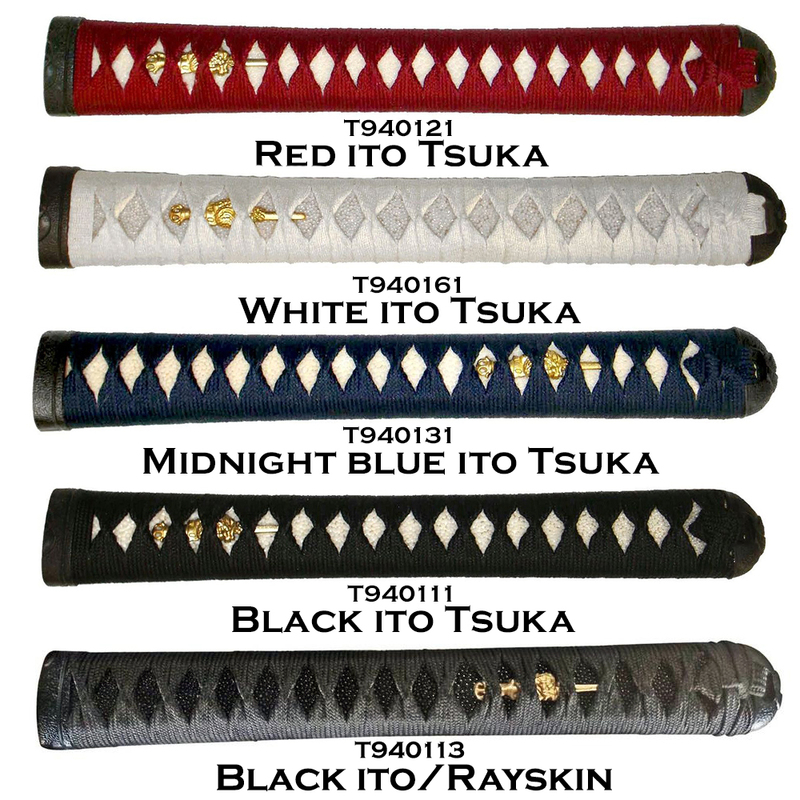 This is so that when the sword is worn or displayed, the more attractive side faces onlookers, and when drawn, the less attractive part faces the opponent..
2) Select tsuka (hande) ito color from 8 different choices of synthetic silk rayon. 3) Select saya style and color. T920322 has a wood-grain finish. T920911 is the natural wood with clear lacquer finish. T920111 is a standard glossy black, T920121 has a textured finish to minimize finger prints and scratches. Click the thumbnail to open a high resolution picture of each option or hover your mouse over a thumbnail for a quick view. This version is only available with a solid bodied (no-hi) blade. 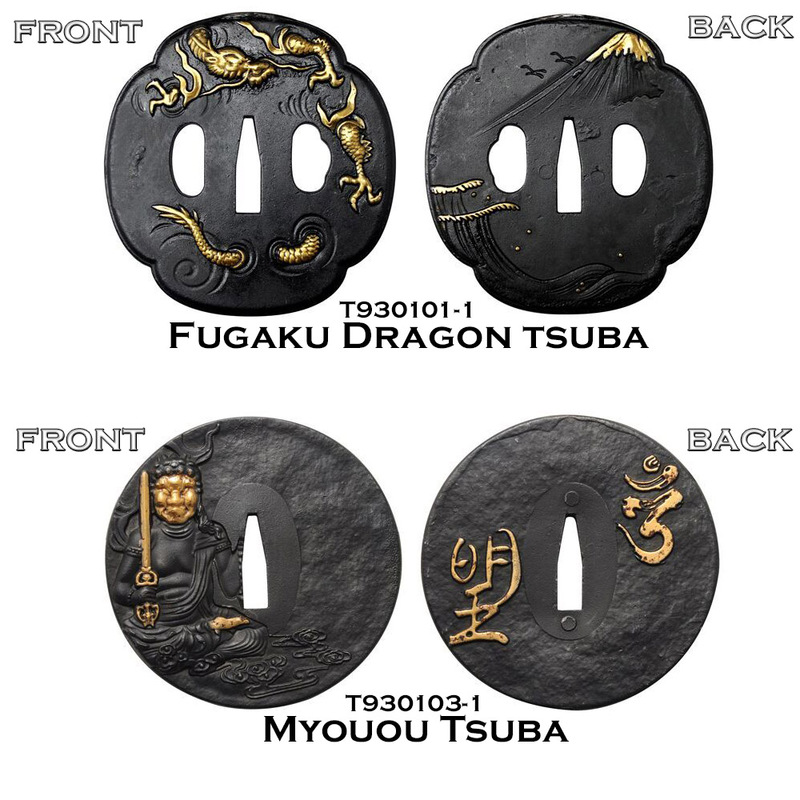 Fuchi and Kashira are generic black iron and will match your overall design and the tsuba you select. Sageo wrap tends to be black and cannot be specified as it is made at the forge. No hidden costs, one price for any and all customization selected. 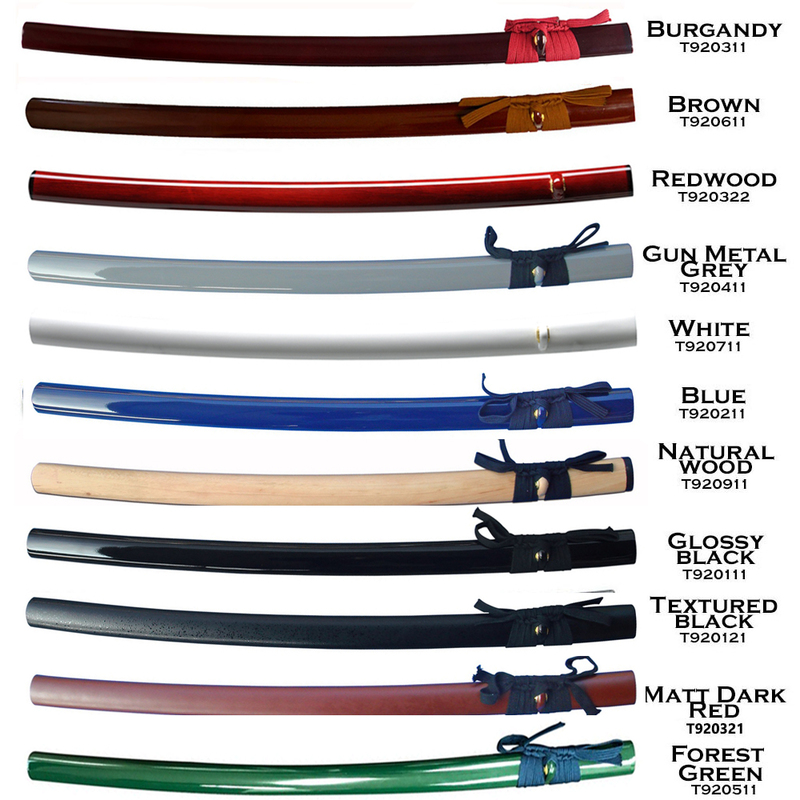 Over 30,000 combinations possible, meaning your sword can be almost as unique as your own personal tastes! Assembled and shipped from the Ryujin workshop in Los Angeles within 1 week after ordering! Suitable for frequent backyard or dojo cutting. Traditional blade - select your own fittings. Differentially hardened fully sharpened T10 Tool Steel blade with real choji midare style hamon and elite polish. 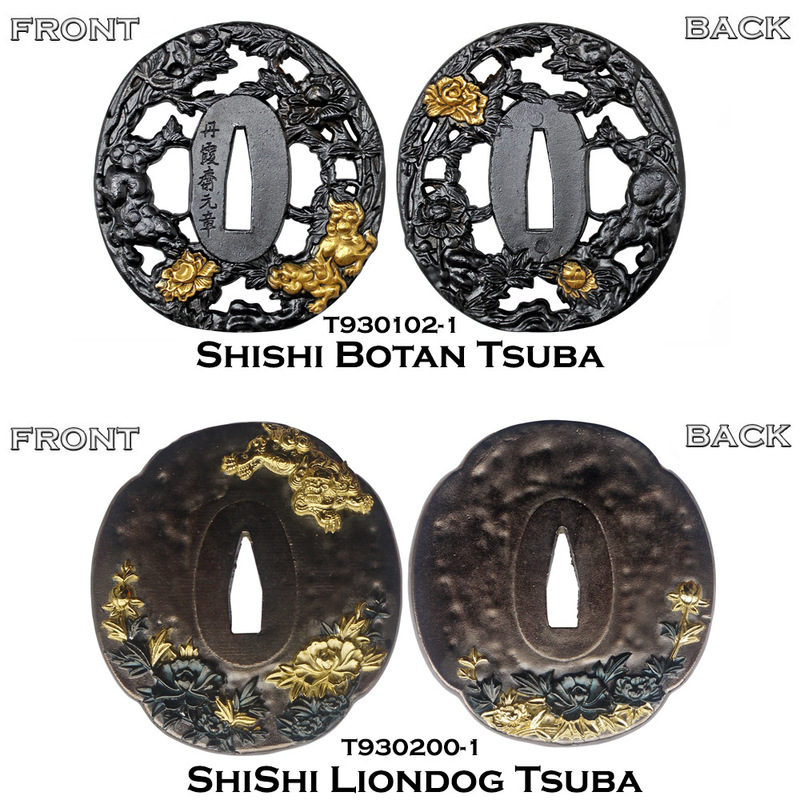 Solid iron fittings with iron tsuba and REAL gold inlay. Rayon hineri maki wrapped ito in your selected color over authentic rayskin. Wooden lacquered saya in your choice of color and style. Been wanting a blade with Choji Midare hamon for a while now. Was pleased to see that not only could I afford one but also get my choice of hardware so to speak. The order process went smooth. Pictures of the available options were of good resolution which really helped making choices. Saya fit is average, not bad, not great...average. A bit of rattle but will retain the katana when inverted. Now please bear with me as I do not have the proper terminology committed to memory as I describe the following items so will use simple terms most should understand. First, all fittings on the blade are very tight. ZERO movement any where. The handle wrap is tight, diamond size varies a bit, at 2 places a bit of wood is visible at the edge of the rayskin. You have to look close to see it though. Rayskin itself is finely pebbled and looks very nice in comparison to what's on some others I own. LOL I know you guys will hate me for this---the guard and pommel---LOL are steel and according to the very nice document enclosed are 1045 steel. The gold plating highlighting the design really sets things off IMO and is nicely done. Now the blade- the hamon is very nice and shows well. From close exam it appears to have been enhanced a bit thru etching? But there is no doubt it real and quite beautiful running the full length of the blade and NOT fading out at the tip which is not counter polished. The polish on the blade is quite good, from hamon to cutting edge is a high polish. Not mirror like but very reflective. Above hamon to spine maybe just slightly less polished as there seems to be a gentle contrast. It looks darn fine to me! There is something else notable about the blade. Unlike every other blade in my collection from a variety of names- DF, Ronin, Hattori, etc, both visually and by feel any unevenness is virtually undetectable. On every other blade I own by running your fingers along the "V" at the top of the spine or along the flat of the blade, waves in the steel from the forging can be felt if not seen. Seems to me a lot of care was taken in making a blade that's very even. Perfect no, but noticeably better by a fair margin. Sharpness- yeah, it's damned sharp! And the entire length of the blade too. Only one other blade I own had this keen of an edge right out of the box, the DF Musha. 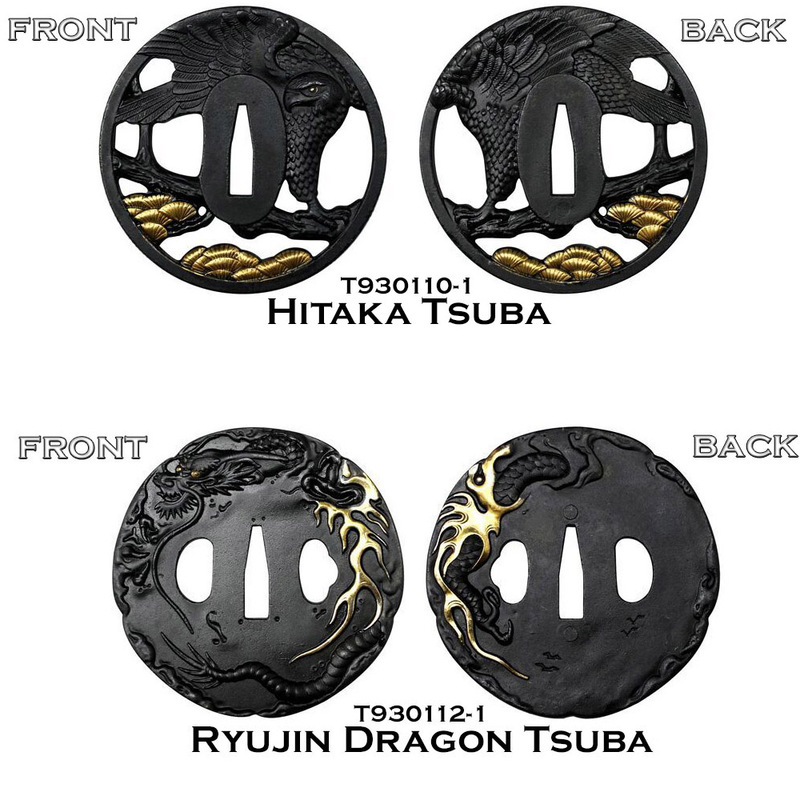 This Ryujin is much sharper then my Ronin, Chenness Oniyuri, etc. One last comment. it came with a very nice document/spec sheet detailing everything including the options it was ordered with. And surprisingly, the signature is real done with a fine felt tip pen. Again, nice touch.